I've finished my 3rd page for my 2017 Gift Calendar album. Each month during 2016 I'm scrapping a calendar page, and by the end of the year I'll have a whole calendar to print. I did this project last year, and I loved the finished project. 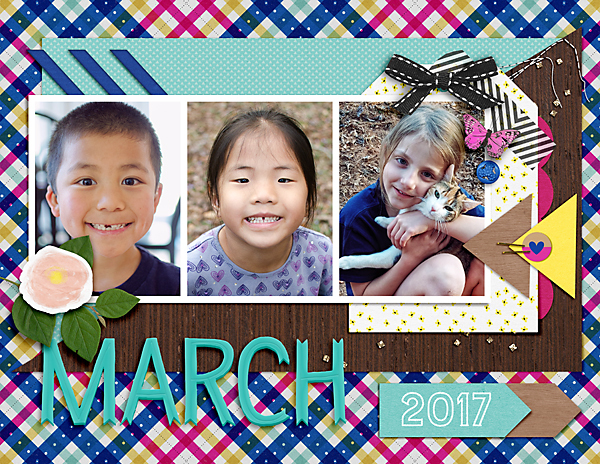 I'm also releasing coordinating calendar templates each month too! I was asked by a customer to make more photo spots for future calendar toppers, and I plan on doing that, especially since one of my kids asked me why I didn't have enough photo spots for her! Oops! Next month I promise to have the option of more photo spots. Do you have a set for the new year? Or an old set I can buy? Thanks!